MY FAMILYS LOVE AFFAIR WITH PUGS BEGAN MANY YEARS AGO. ALTHOUGH I HAD BEEN ALONGSIDE PUGS PRACTICALLY ALL OF MY YOUNGER DAYS,CHANGING CIRCUMSTANCES OF ADULTHOOD MEANT I COULD NOT SHARE MY LIFE WITH THESE DELIGHTFUL BEINGS. 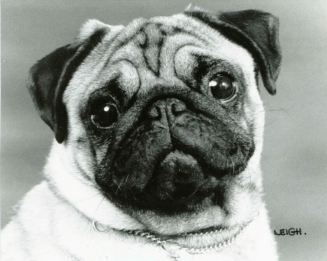 IN THE EIGHTIES LIFE CHANGED ONCE AGAIN AND ONCE AGAIN THE TEASELTAIL PUGS BECAME FAMILY MEMBERS. THE SHOW SCENE OF TEASELTAIL PUGS BEGAN AGAIN. THROUGH STUDYING BREED LINES, CONFIRMATION AND PEDIGREES I HAVE LEARNED MUCH OVER THE YEARS. OF COURSE WATCHING THE FAMILY PUGS THEIR PROGRESSION TO THE PRESENT DAY TYPE HAS CERTAINLY BEEN AN EDUCATION INITSELF. MY SON JONATHAN AND MYSELF VERY OCCASSIONALY BREED BUT OUR MAIN CONCERN IS HEALTH. WE ONLY EVER HAVE A LITTER WHEN WE NEED SOMETHING FOR THE SHOW RING, WE KEEP OUR OLDIES WITH US AS THEY ARE PART OF THE FAMILY. WE XRAY ALL OUR BREEDING PUGS FOR HEMIVERTABRAE. WE RESEARCH CAREFULLY HEREDITARY PROBLEMS AND TRY AS MUCH AS POSSIBLE TO BREED ONLY THE BEST OF TEMPREMENTS AND THE FITTEST OF PUGS. MOVEMENT ALONG SIDE BREED TYPE AND COMPLETE SOUNDNESS IS VERY IMPORTANT. 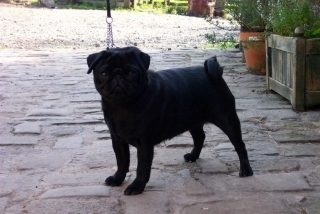 I MUST STRESS IFANY PUG DOES HAVE BREATHING DIFFICULTIES IT SHOULD NEVER BE BRED FROM, FIT PUGS BREATHE VERY WELL IN MY OPINION IT IS NOT A BREED CHARACTERISTIC AS MANY PEOPLE SEEM TO BELIEVE. 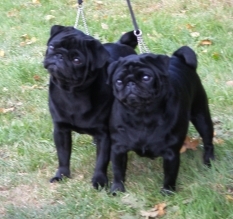 ONLY SHOW QUALITY PUGS ARE EVER BRED FROM AND NOT OFTEN. WE ARE ONLY A SMALL FAMILY OF PUGS AS ALL OF THE CLAN LIVE ALONGSIDE MYSELF AND JONATHAN IN THE HOME. THE SHOWING BUG WAS REGENERATED AGAIN WHEN I ENTERED A THEN EXEMPTION SHOW (A VERY LARGE WELL SUPPORTED SHOW ONE) AND WON BEST IN SHOW..THE SHOW BUG HAD BITTEN AGAIN. THE NEXT SHOW BEST PUPPY IN BREED AND BEST PUPPY IN SHOW... THE ADDICTION WAS NOW TRULY SET... AND SO WE CONTINUE. TO SKIP TWENTY YEARS WE HAVE WON BEST OF BREED AT CRUFTS 2007, CHAMPIONSHIP GROUPS 2AND 3, CHAMPION STAKES PUPPY STAKES TOP PUPPY AND MANY MORE IMPRESSIVE WINS. HE WON 1ST MINOR PUPPY DOG AT HIS FIRST CHAMPIONSHIP SHOW LEEDS2009. WE WERE VERY PLEASEDAS THIS QUALIFIED HIM FOR CRUFTS AT HIS FIRST SHOW. HE HAS BEEN PLACED WELL AT THE CHAmpioNSHIP SHOWS HE HAS ATTENDED. SEE OSWALDS OWN PAGE.